I have this tradition with my friend Amanda that every week we go to each others house for a meal. It is a chance for the kids to hang out, an opportunity for us to talk and an opportunity for me to exchange some recipes with Amanda. Last week we went to her house for Sunday lunch, and she made burgers. My kids were so thrilled that they claimed that those were the best burgers ever. I pulled Amanda aside because I had to know the secret. To my surprise, she did not buy the burgers; she made them herself from scratch. The following day I went to the local store to purchase a meat grinder so I can make delicious burgers just like Amanda did. I have to be honest – since that Sunday at Amanda's, I have been on a mission to find the best meat grinder between them all. 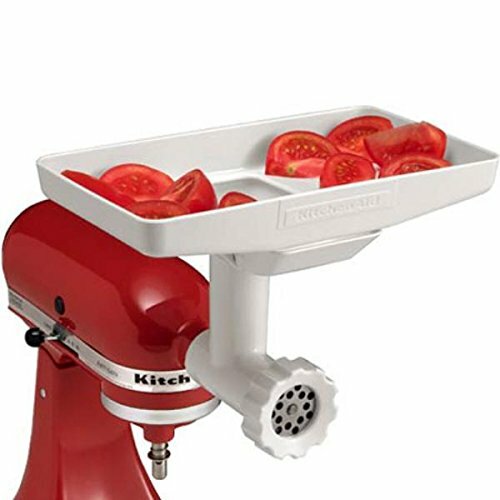 How To Choose An Ideal Meat Grinder? Is It Safe If You Have Children? 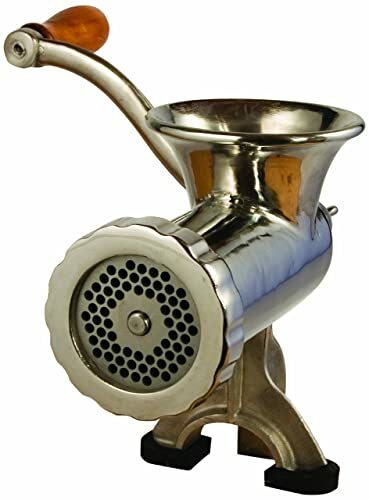 A meat grinder can also be called meat mincer. It is a kitchen appliance that we use for grounding and mixing not only meat but veggies too. You can put the meat in the grinder no matter if the meat is raw or cooked. 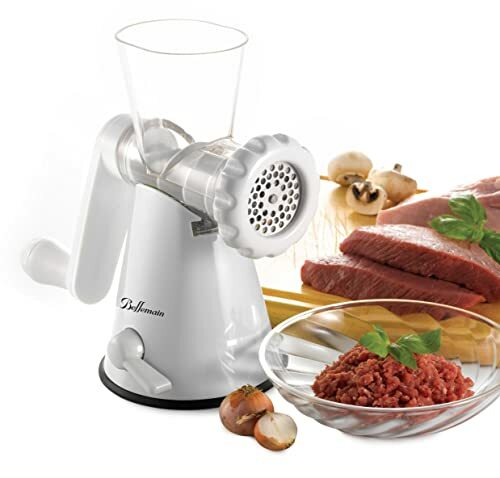 The meat mincer is made to replace tools like mincing knife for example. When choosing a meat grinder, there are many factors that you should pay attention to. They have the same purpose, but they have different features. And if you look carefully into the attributes that each one has, it can either make your job preparing the meat easier or more complicated. 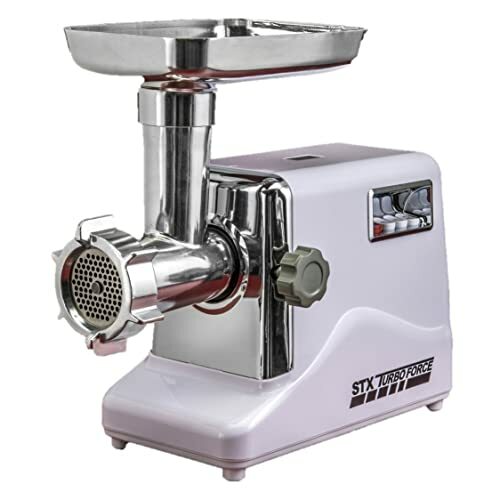 I would like to share with you the most important characteristics and factors that you should look for when searching for a meat grinder that suits you the most. As someone who spends a lot of time in the kitchen, I can say that products that are easy to use are life savers. If something is too complicated, it will waste a lot of your time. You will have to read the instructions more than once, and you will lose time on figuring out how it works. I honestly think that we can all agree – that is just an additional reason for unwanted frustration. There are two criteria that I believe an easy to use meat grinder should have. When it comes to meat grinders, there are two types, manual and electric grinders. The electric one is just easier to use it does not take a lot of time or energy. The manual one is not so bad but compared to the electric one it does give a worse final product. I tried out both, and the electric one just did a better job. The result of the manual grinder was not the same quality. And after using the manual one I had to rest for a while. If you decide to buy a manual grinder, you MUST be comfortable when using it. It does not matter where you put it; it is important that it can be strengthened anywhere you want. So when you use it, it stays in one spot. When choosing a meat grinder, just be sure that it has a fixator. Also look at the handle that you will be holding while grinding the meat. I would recommend handles that have rubber grips because they are more comfortable than the metal or wooden ones. If you are after an electric grinder, you do not have to worry about these two specifications. When using a manual one you are the one who controls the speed. So it depends on your energy and strength. On the other hand, electric grinders can also have more than one speed that they can reach. So I would recommend the ones that have a speed adjuster. When I decide to buy any product that includes knives or flames or anything dangerous I make sure that it meets Child Safety Requirements and that it has a safety lock. If you do not have children, I think you should look at these specifications too because you never know when your neighbors might show up with their kids. Children love to play with everything, so they will probably want to touch the grinder too. Don’t forget to find a meat grinder that has this feature. Safety might be a problem if you fixate your manual grinder and small kids show up you have to make sure that you either move your grinder or that the kids aren’t playing around it. After the meat is chopped, the job is still not done. You have to clean up the mess that you made. If a grinder is easy to separate you will not have a problem cleaning it up. This is the one feature where I think the manual grinders are better. You just disjoin the parts and wash them. You do not have to worry about any electrical parts. Also, there is no dilemma if you can put something in the water or not. You should also check if your grinder is made out of materials that do not rust. I would recommend the ones that are made out of steel. They are resistant to rust, but they have a tendency to be heavy. 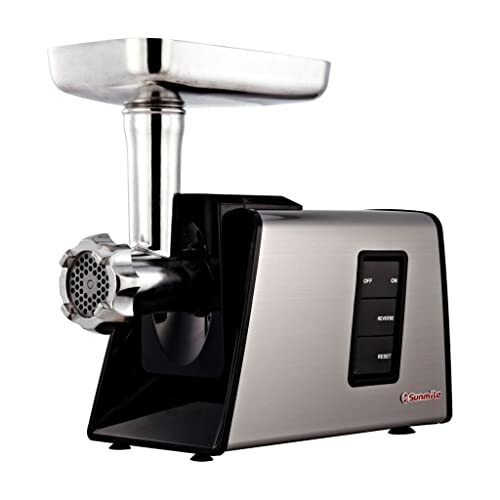 There are different grinders, and they all come with different specifications, and since I am here to help you, I will tell you something more about top five meat grinders. And this will hopefully make it easier for you to choose which one suits you the most. The first meat grinder that I used in my house is STX-3000-TF. I found it easy to use. Since it is electric, I had no trouble putting the meat on the silver plate and turning it on. It did all the heavy work for me. The thing that is great about this meat grinder is that it has three speeds: high, low and reverse so you can adjust it. It also comes with three steel grinding plates - fine, medium and coarse. Three stainless steel cutting blades and a three-piece set of sausage tubes are in the package as well. This meat grinder is meant for grinding meat or veggies it is not meant for grinding bones, but my friend Amanda claims otherwise. The dimensions are 19.0 inches front to back, 8.0 inches wide and 14.0 inches high. So for my kitchen, it is a little too big, so I have to store it in my pantry. The buttons for turning it on and off are put on the side and placed in a hole, so my kids can not reach them. So I don’t have to worry about my kids getting hurt. I was satisfied to find that it is easy to wash, on the contrary to the common belief. The best part is that every STX product has a three-year guarantee. This grinder is made out of stainless steel, and it allows you to clean it easily, without any worries that it will rust. And this product is made to last. The dimensions are small, so it is practical – you can put it anywhere. The grinder has a wide opening on the clamp that will allow you to fix it where you like. And you do not have to think if it will move or not. You can wash it with ordinary dishwashing soap and after that just use a towel to wipe it. But it is not recommended to put it in a dishwasher or using bleach when cleaning it. When it comes to a manual grinding, you have to bear in mind that it will take a lot of effort and that you have to twist the handle and feed the grinder with meat at the same time. Also, safety is a big problem – it always has to be out of the children’s reach. The grinding process also lasts longer so your meat can warm up, and that increases the chances of your meat getting bacteria. This grinder is said to be made out of stainless steel, but you should not expect that your grinder will be made entirely out of stainless steel. The body is made out of aluminum that is covered with stainless steel wrapping. This should not cause some bigger problems, but you should know what you are buying. This grinder can grind up to 185 pounds of any meat per hour. If you have a pet, it will not be a problem if you grind some chicken bones – this grinder can handle it. The grinder has three buttons: ON/OFF, reverse function and reset function. It took me 15 minutes to assemble it and take it apart. So if you want to clean it, it will not take long to disassemble it. But you have to be careful when washing and drying because some parts are prone to rust. You can use the food grade oil and put it on the parts that can rust to prevent that from happening. Also, the feeding tube is quite small so that can be a problem. You have to cut your meat into smaller portions. The weight of this grinder is 13.56 pounds. I find this grinder safe for children, as it needs proper usage to start, and small children probably won’t be able to reach it. This little grinder is so practical and easy to use. I think that this is the perfect size for a meat grinder. It does not occupy a lot of space on the counter; it’s quite easy for maneuver, quick to disassemble... Quite good. It is a manual meat grinder, so you will have to use your strength to chop your meat. Still, the grinding is not that hard to perform compared to another manual grinder I reviewed, but the amount of ground meat is significantly slower, so you’ll spend more time grinding. The handle is plastic, so you might get a sensation that it’s prone to breaking during robust swirling. But the grinder has a strong suction base that ensures that your grinder will not move on the counter while you work. This product has a simple hand crank that gives you full control, and it also makes it safe to use. It is mostly made out of plastic so cleaning it is not so difficult. You can also put the parts into a dishwasher. The grinding blade and disc are made out of stainless steel, so you do not have to worry about them rusting. Here we have an alternative to the classic meat grinders and something for people who already have many appliances in the kitchen as well. Buying this attachment can turn your mixer or multipractic into a full meat grinder/sausage stuffer. Quite convenient and practical (needless to say – cost-effective). Many of my friends have this Stand Mixer, and they swear by it. Let’s see what it brings to the table. The instructions that come in the package on how to assemble the Meat Grinder attachment are important from the beginning. Next, the thing that really takes attention is the thickness of the tube; it requires cutting your meat into quite small pieces. The good thing is that the speed of this attachment is faster than a manual grinder. It is easy to wash, and it does not rust, and that is great. It is safe if you have kids you do not have to worry about them touching it. The important thing to mention is that you’ll need a KitchenAid stand mixer to make it to be fully operational. Connecting with other brands isn’t impossible, but it is a bit tricky. Still, if you have the prerequisite machinery, this attachment will serve you quite well, and it’s well worth the money. My task to find the best meat grinder was not easy. I tried out all sorts of meat grinders, and I made a lot of delicious meals. In the end, they all give a similar result. And someone who is not in the kitchen that much maybe will not see the difference, but I do. All of the meat grinders have their pros and cons but the one that I find the best is STX-﻿﻿3000﻿﻿-TF. This grinder is so easy to use, and it is really fast. I have my meat done and wash the grinder in no time. Also, I do not have to worry about my kids touching it. Three-year guarantee ensures that you’ll be covered no matter what happens. You will not be disappointed if you buy this one!